So that's it guys, we're back in North Wales! The trip was absolutely amazing and we can't believe how much we've done and seen. We feel so bloody lucky! There was loads to discover and even though we've had almost 10 days in the city, we actually felt like we didn't have enough time to do everything. 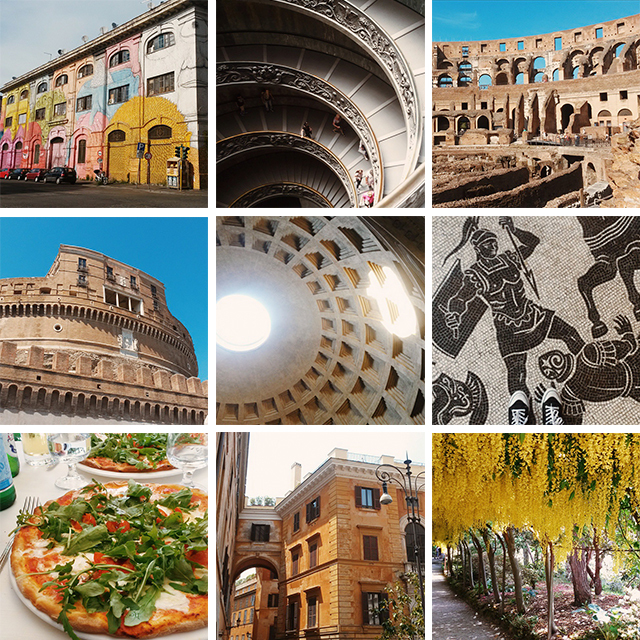 So I would definitely recommend Rome for people crazy about history (and food!) like us because you won't be bored! We were staying in an apartment that we booked through HouseTrip, and it was great to realise that we were in a cool, industrialised area // The striking stairs that lead you to the exit of the Vatican Museums // Well, the Colosseum, obvs // I was really impressed with the Castel Sant'Angelo! // Morning light through the top of the Pantheon // Beautiful mosaic in the San Sebastiano Gate's museum // The best pizza EVER // Sweet little streets in Centro Storico // And that's yesterday at Bodnant Garden back in North Wales, when we realised that we had to go back to work but we still needed to relax! Hope you have a great evening and weekend chaps! Giveaway - Free June wallpapers!